THE RED FLAG ASKS: DOES PRESIDENT TRUMP HAVE THE DIVINE RIGHT OF AMERICAN KINGSHIP & WILL THE SUPREME COURT BACK HIS ASSERTIONS? The Mandate of Heaven or Tian Ming is a Chinese political and religious doctrine used since ancient times to justify the rule of the King or Emperor of China. According to this belief, heaven (天, Tian)—which embodies the natural order and will of the universe—bestows the mandate on a just ruler of China, the "Heavenly Son" of the "Celestial Empire". If a ruler was overthrown, this was interpreted as an indication that the ruler was unworthy, and had lost the mandate. It was also a common belief that natural disasters such as famine and flood were signs of heaven's displeasure with the ruler, so there would often be revolts following major disasters as citizens saw these as signs that the Mandate of Heaven had been withdrawn. The Mandate of Heaven does not require a legitimate ruler to be of noble birth, depending instead on the just and able performance of the rulers and their heirs. Dynasties such as the Han and Ming dynasties were founded by men of common origins. The concept is in some ways similar to the European concept of the divine right of kings; however, unlike the European concept, it does not confer an unconditional right to rule. The Mandate would be a preoccupation in a rulers lifetime, where they would hold onto the Mandate and live according to Heavens. Intrinsic to the concept of the Mandate of Heaven was the right of rebellion against an unjust ruler. Chinese historians interpreted a successful revolt as evidence that Heaven had withdrawn its mandate from the ruler. Throughout Chinese history, times of poverty and natural disasters were often taken as signs that heaven considered the incumbent ruler unjust and thus in need of replacement. The Mandate of Heaven was often invoked by philosophers and scholars in China as a way to curtail the abuse of power by the ruler. While each dynasty was not the same, they each had a lineage that passed on the prospective ruler by order of generational descent or their priority of birth. Many emperors during the imperial times would optimize to have many sons who could be candidates to fill the position after the current ruler has died. In addition Heaven was thought to be of how a ruler's works and performance was, which reflected upon how favorable they would be to Heaven. The Trump administration is on a deadline to reunite families separated at the southern border. 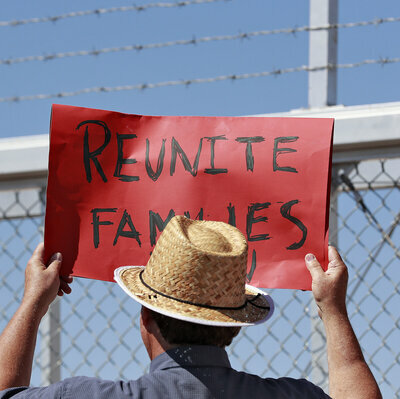 On Tuesday, a federal judge ruled that all families have to be reunited within 30 days. 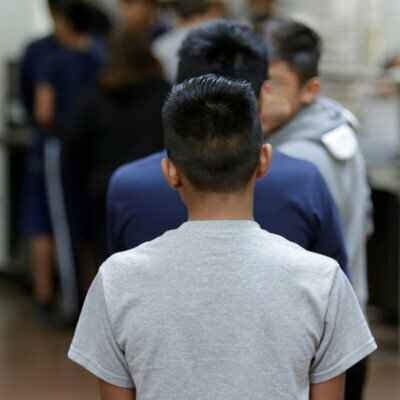 But advocates and activists who have already been trying to reconnect individual migrant children with their parents say their experiences suggest the process of reunification will be complicated. A case in point is Emily Kephart, who works for a nonprofit called Kids in Need of Defense, or KIND. Two weeks ago, she got an unexpected email from Guatemala about a 6-year-old girl. Back in mid-May, the girl and her father had attempted to migrate to the U.S. The father, who is still in ICE detention, had at least managed to alert his family back in rural Guatemala. Through word-of-mouth, the family had finally reached a local community group that happens to be one of the ones Kephart has worked with. Kephart's first move was to call the hotline maintained by the Office of Refugee Resettlement — the U.S. government agency to which U.S. Customs and Border Protection had been transferring migrant children when it detained their parents at the border. Kephart gave the operator the girl's name and date of birth. The operator typed it into a database. Then there was a pause. It was as if this girl never existed. But then there was a clue. But that is all the operator would say. She told Kephart she wasn't allowed to reveal where this girl with the similar name was being held. Kephart was convinced she was on the right track. So she called up a case manager at a shelter for migrant kids whom she happens to know personally. And that woman was willing to look up and tell Kephart which shelter was holding the girl with the similar name. Kephart happened to know a case manager there, too. So she called up that shelter. "And no sooner do I get the name out of my mouth, she says, 'Oh my gosh! Yes!' "
It was the same 6-year-old girl. The shelter had been told she had been separated from a parent, but that's all. "We've been — we don't have anything to go on!" Kephart says the case manager exclaimed. "I'm so glad to talk to you." Now that the father and daughter have been matched, the shelter has been trying to coordinate a phone call between them. But with the father still in detention, that's proving complicated. They're also working to set up a call with the girl's mother back in Guatemala. But here, too, there have been delays because they first needed to verify the mother's identity. Kephart managed to get a copy of the girl's birth certificate from the family and send it on to the case manager. But the first version was too blurry. The upshot: At least five weeks since the girl was taken from her father, she still hasn't spoken to anyone she knows. "And she's 6," adds Kephart. At a weekend rally for South Carolina Gov. 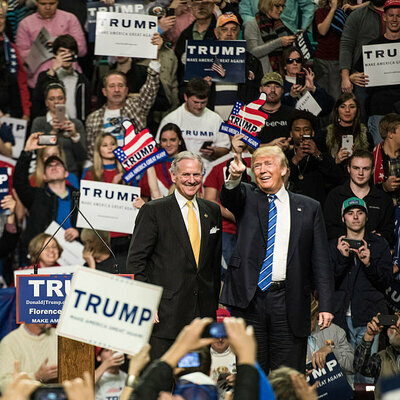 Henry McMaster ahead of Tuesday's GOP primary runoff, Pence touted Trump's achievements in the same breath that he stumped for Republican candidates. "You look at the last year-and-a-half of this administration and I gotta tell you, there's only one way you can describe it," Pence said, going on to sum up the administration's record: "Promises made and promises kept." 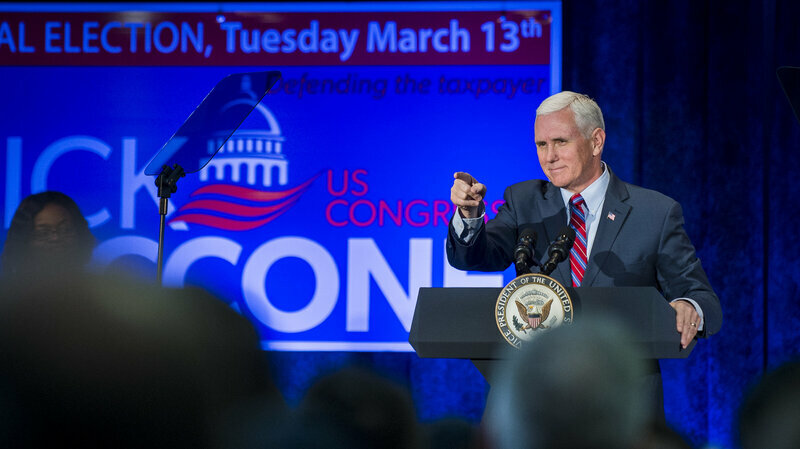 In front of the crowd gathered on a college campus near Myrtle Beach, Pence talked about tax cuts and job growth, issues Republican leaders want to focus on this year. But amid a heated debate over the separation of families crossing the U.S. border illegally, Pence only briefly alluded to immigration, prompting familiar chants of "build that wall!" Unlike the president, who has sent mixed messages on immigration policy in recent days and often veers away from Republican talking points to embrace border security as a "good issue" for the GOP, Pence is known for being disciplined. That means avoiding anything that might steal the spotlight from Trump. He has been traveling the country, fundraising for Republican candidates and organizations, sometimes drawing several million dollars in a single trip. He's also holding events to urge GOP voters to turn out in November and maintain their congressional majorities. "Republicans are very energetic right now," said Marc Lotter, a consultant to the Republican National Committee and Pence aide. "They see the positive momentum going on with the economy. They see the leadership that's being shown by the president on the world stage; they want to keep that." As the election draws closer, Lotter said, the vice president will spend more time holding campaign rallies in strategically important areas, both for members of Congress and for Republican governors, several of whom face tough races this fall. Much of Pence's midterm campaign travel is funded by his leadership PAC, the Great America Committee. Its creation has fueled speculation about Pence's own political ambitions. Lotter said the vice president is focused on promoting President Trump and electing Republicans this year, allowing that it could benefit Pence in the long run. 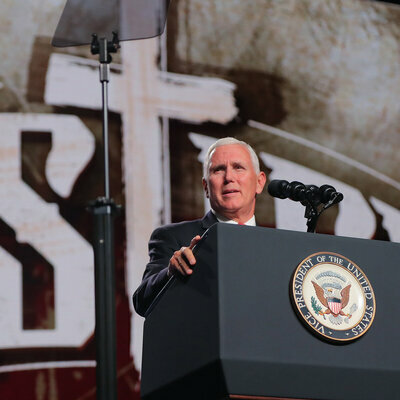 "Any vice president, regardless of party, their political future — whatever that may or may not be — solely lies on the success of the president they serve," Lotter said. "And so in this case, the vice president is solely focused on the president and the president's agenda. And that success will determine everything for the vice president." Pence has plenty to gain from the reputation and relationships he's building while stumping for Republicans across the country, said GOP pollster Chris Wilson. "I think anytime somebody who's in elected office says they're not thinking about their political future, they probably should go to penance or make a donation to the church or something," Wilson said. "It's not likely that that calculation doesn't enter into the back of someone's mind. Whether it's making an endorsement, who they campaign for, or a dollar that they raise and a donor that they meet." "That isn't a choice for Vice President Pence to make; he either is wholly loyal to the president or he doesn't have a future within the Trump party," Hershey said. ProPublica: "I’ve Been Reporting on MS-13 for a Year. Here Are the 5 Things Trum..." — "I’m spending the year reporting on MS-13 members and their associates. I’ve been combing through their text messages. I’m talking with the detectives building cases against killers not yet old enough to buy cigarettes. And I’ve been spending long evenings with the gang’s victims, who often start crying as soon as they start talking about the violence that has marred their lives. Everyone agrees the gang is bloodthirsty. Most of the other assertions I’ve heard from the Trump administration this year about MS-13 have almost no connection to what I’m seeing on the ground." The Washington Post: "Mike Huckabee tweets photo comparing Nancy Pelosi’s campaign staff ..." — "Hours before Mike Huckabee lamented the treatment of his daughter at a Virginia restaurant, the former Arkansas governor tweeted a photo Saturday morning of a group of tattooed gang members and suggested they made up Democrat Nancy Pelosi’s campaign committee to 'take back' the House of Representatives. The false implication was clear: Huckabee was another of many Republicans once again trying to stick the House minority leader with the image of an MS-13 gang sympathizer. 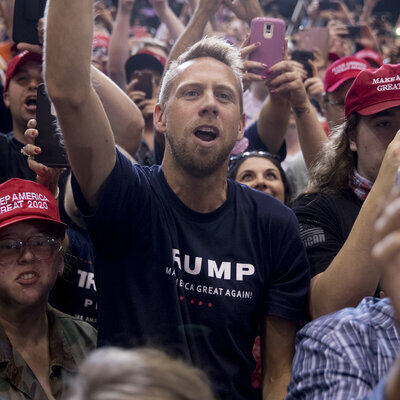 'Trump and his surrogates will continue to repeat blatantly false attacks as long as the media continues to take the bait and print them,' Pelosi spokesman Drew Hammill told The Washington Post." In the wrenching national debate about immigration, Americans are hearing a lot from their president about violent gangs – specifically a gang called MS-13. Who are they? Where are they? What threat does MS-13 pose, to themselves or to others? Why does President Trump talk about them so much this election year? We’ll talk to experts on the gang and its history, and to a political reporter. 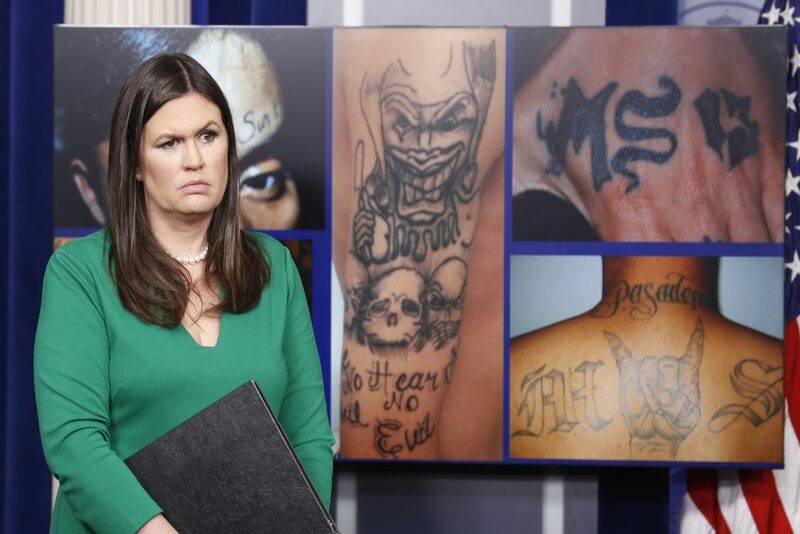 This hour, On Point: Understanding what MS-13 is, and is not. Tea Party founder and conservative billionaire Charles Koch has attacked Donald Trump's controversial travel ban, branding it as 'authoritarian'. Koch said he will oppose the billionaire president if and when he deviates from a commitment to 'free and open societies'. 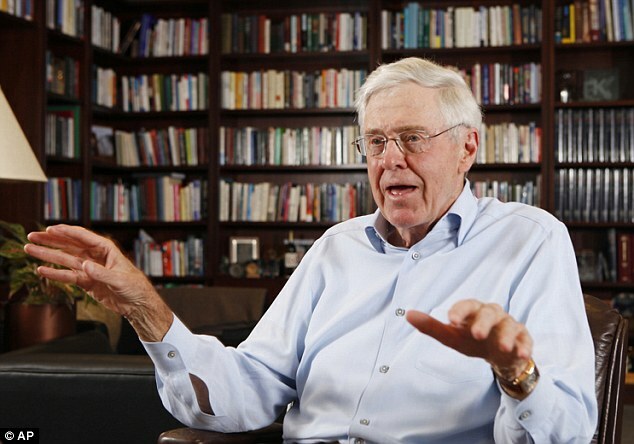 Koch is also apposed to plans to spend billions of dollars on major infrastructure protects across the country. Members of the business community are voicing their outrage at President Donald Trump's new immigration policy of separating children from their parents at the border, including a group being funded by billionaire industrialists Charles and David Koch. The Libre Initiative, a nonprofit group financially backed by the Koch brothers, called on the Trump administration on Tuesday to reverse course on what's been called a zero tolerance immigration policy, which forces children to part ways with their families if they illegally cross the border. The Libre Initiative, a nonprofit group financially backed by the Koch brothers, called on the Trump administration on Tuesday to reverse course on what's been called a zero-tolerance immigration policy, which forces children to part ways with their families if they illegally cross the border. 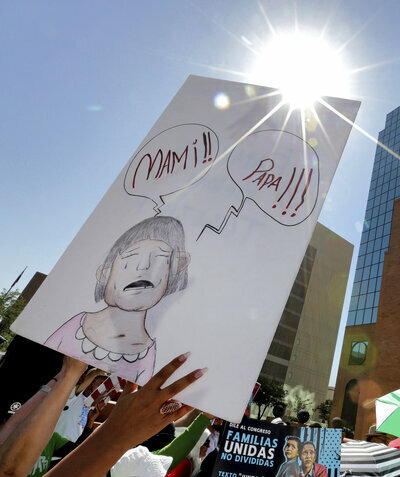 "The president should take immediate action to end the separation of families at the border by rescinding the 'zero tolerance' policy," Daniel Garza, president of the initiative said in statement. Garza also said his organization will not support two immigration bills that are being crafted within the halls of Congress because he does not believe either do enough to protect participants of the Deferred Action Childhood Arrivals program, also known as Dreamers. 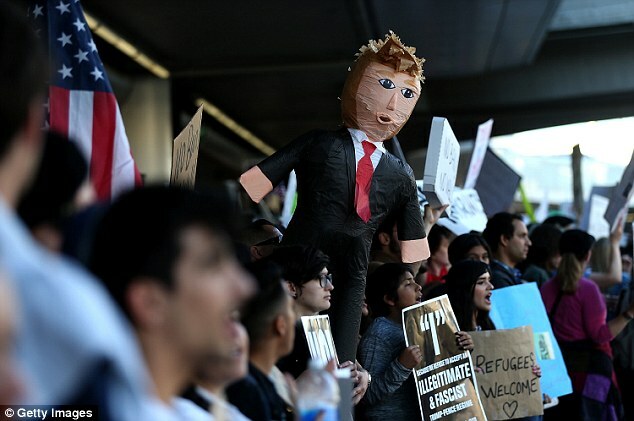 The Business Roundtable, chaired by J.P. Morgan CEO Jamie Dimon also blasted the White House for their latest hostilities toward migrants trying to come into the United States and called for it to be terminated. "Business Roundtable urges the Administration to end immediately the policy of separating accompanied minors from their parents. This practice is cruel and contrary to American values," Chuck Robbins, CEO of technology conglomerate CISCO Systems and chairman of the Business Roundtable Immigration Committee, said in a statement. The Business Roundtable includes some members who are supporting Trump's re-election efforts, including Steve Schwarzman, the CEO of private equity behemoth Blackstone. In December 2017, Schwarzman contributed $344,400 to Trump's joint fundraising committee, the Trump Victory Fund. A spokeswoman for Schwarzman did not return repeated requests for comment asking whether he was willing to denounce the policy himself. One of the most powerful business lobbying groups in the U.S., the Chamber of Commerce, was also not pleased with the new immigration initiative. Thomas Donohue, the Chamber's president, denounced the policy in a statement. "Thousands of children are being forcibly removed from their parents by our government. There is no other way to say it, this is not who we are and it must end now," Donohue said. Trump, however, seems to be shrugging off the criticism and forging ahead with his plans. He defended the decision in a speech during the National Federation of Independent Businesses' 75th-anniversary event in Washington D.C.
Don't be fooled. 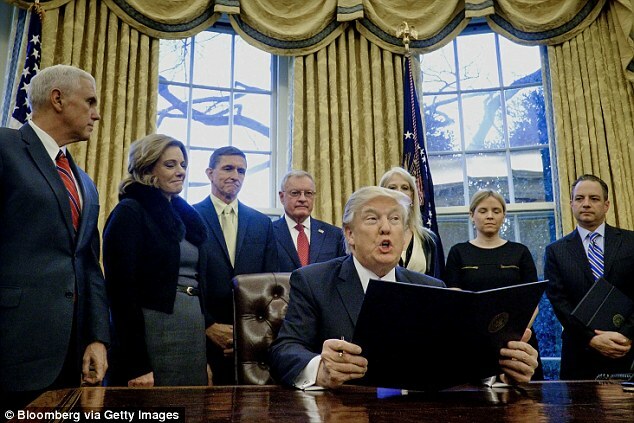 The only reason that Trump did the Signing Statement is because Koch Network forced his hand. Trump is like the judge at Luke 18, he fears neither God, nor public opinion, but he does fear and respect Charles Koch. He needs the Kochtopus money in order to run in 2020. Trump like the various psychiatrist have stated is unfit for office. The post is long, but it does not require reading. Look at the videos and listen to the broadcasts. Your future may depend on you knowing the whole of the story: freedom of the press insures peace of mind. Our terrorUSt$' 20th Century militant anti-socialism policies -genocidal propping-up of Latin America u.s. corporatist puppet oligarchial autocracies- wished upon and forced upon Latin America the kind of Darwinian capitalism that has best served the interests of u.s. corporatist militarism, generations of which puppetry has raised Latin American generations who must flee the violent injustice in their homelands which with righteous irresponsibly was sown by the United States. Americans are in for a difficult times very hard to deal with for the next decade, but we have survived worst. America has built up a past with South America and the Middle East that we will all have to pay for in blood and treasure. We have been taught that WE are always innocent, but history tells a different tale. It is up to the Democrats not to sit on their hands in November and persistent because all kinds of tricks will be played at the polls. Some names will be gone from the rolls. Trump preached so many lies about fake news until that shooter in Maryland took him seriously. The man was unstable and with Trump egging him on he shot 5 reporters. The only thing fake in America is Trump himself.